Dipping into the archives again this week. 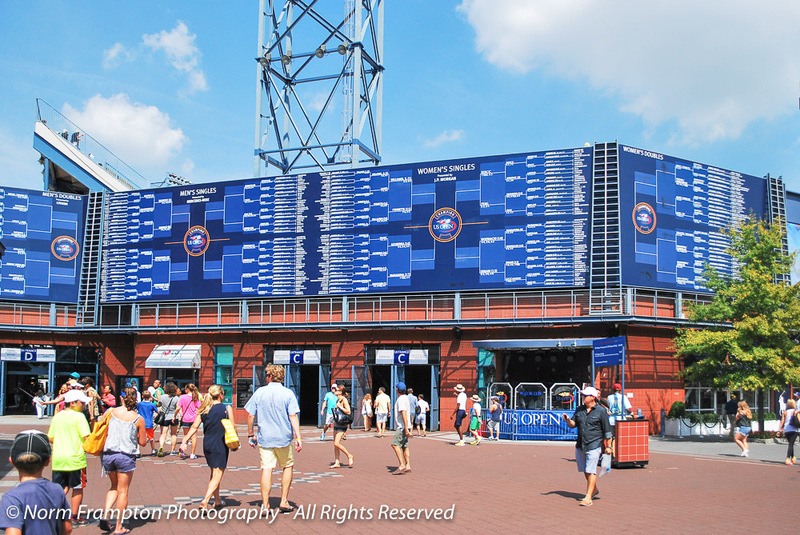 As an avid tennis fan I’m fortunate to have attended the U.S. Open tennis tournament in New York City a number of times over the past few years. 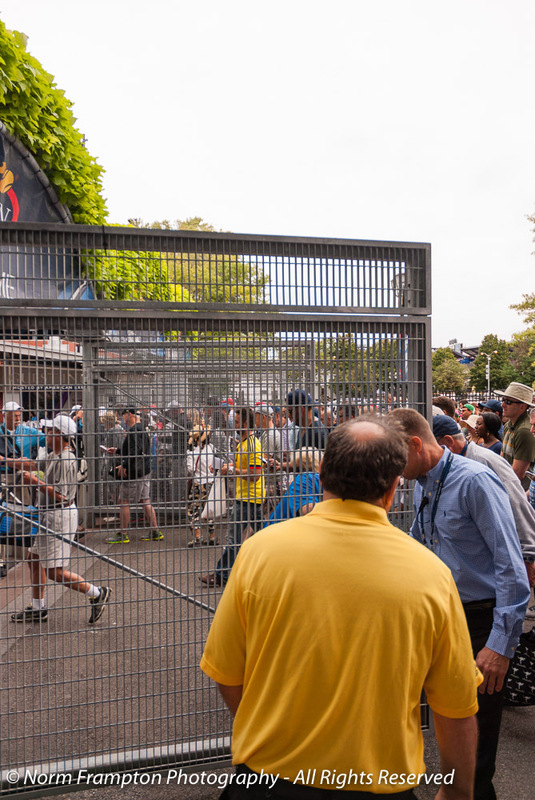 One of the four major Grand Slam events, along with the Australian and French Opens and Wimbledon, this is a 2-week tournament that’s played simultaneously by 128 of world’s best men and women players. 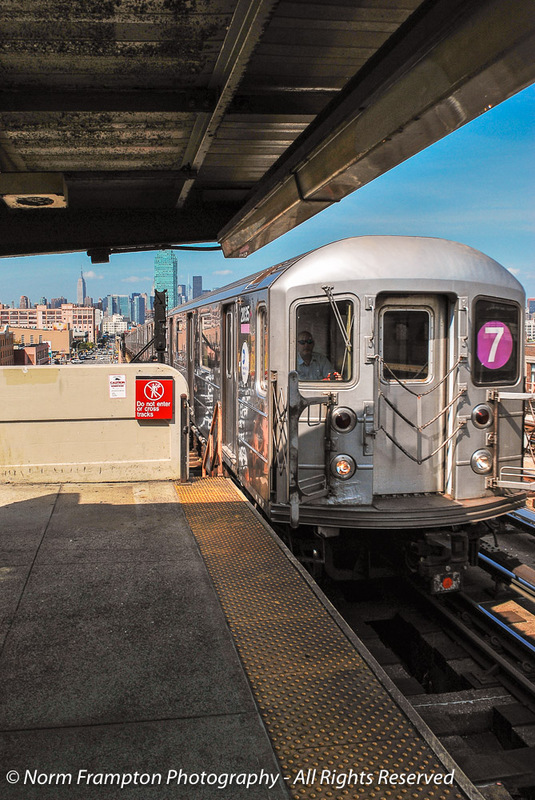 For fans the best way to get to the National Tennis Center, where the tournament is held, is by taking the number 7 train from Manhattan. Train door and a small peek at the New York skyline. Disembarking at the Mets-Willets Point stop lets you off onto an elevated walkway that leads to one of the Center’s two main entrances. It’s a 5-minute walk from the train to the gates along the elevated boardwalk. With the main stadium in view the entire time, you can feel the anticipation build the closer you get to the complex. The transit authority has a train maintenance yard below the boardwalk. The main stadium with its new retractable roof. Look Dan!!! So many trains!!! And so many doors too. A retractable roof is a kind of door, right? 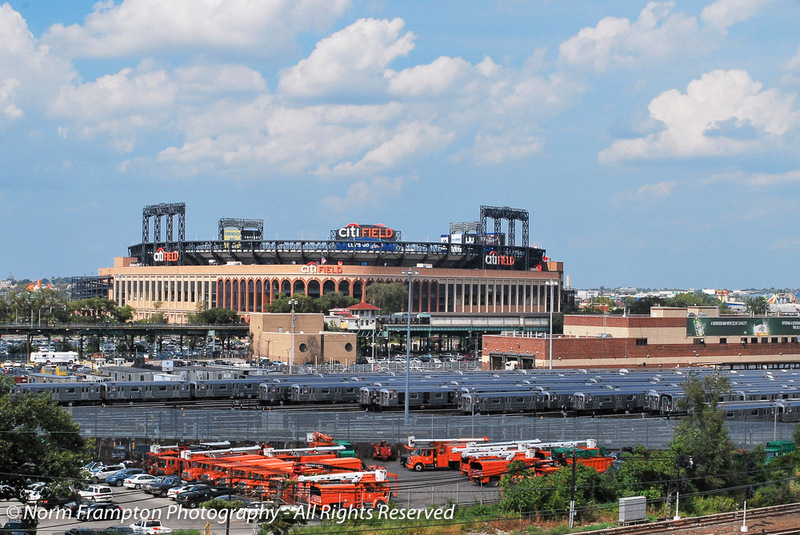 On the opposite side of the tracks from the tennis center you’ll find Citi Field – home of the New York Mets baseball team. Baseball? M’eh maybe next time. Matches start at 11:00 AM but fans with general admission passes, and/or nuts like me, like to get there for 9:30 to be among the first through when the doors open. Those who arrive early are usually planning to scope out the best of the available non-reserved seats. 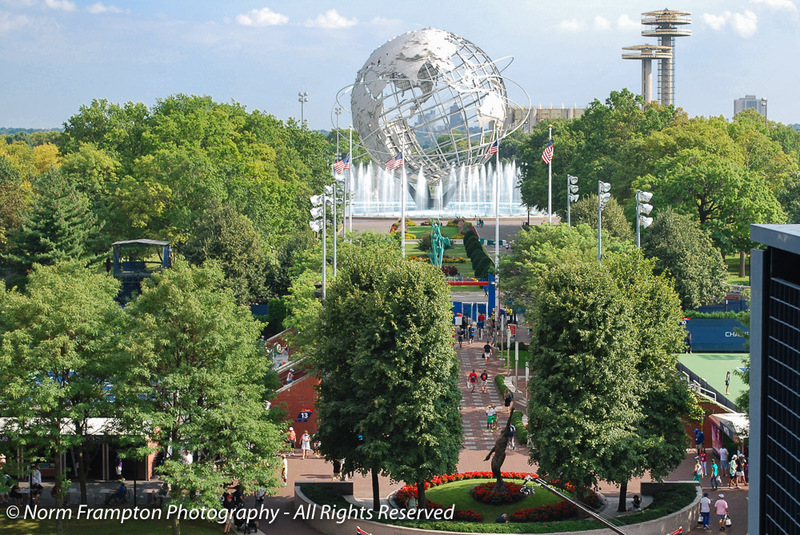 A simple general admission grounds pass is an affordable way to check out the action, especially with kids, and gives access to a limited number of non-reserved seats on all of the courts except the main Arthur Ashe stadium. Another common goal of the early arrivals is to camp out at the practice courts in the hopes of getting a close-up views or pics of their favorite players. 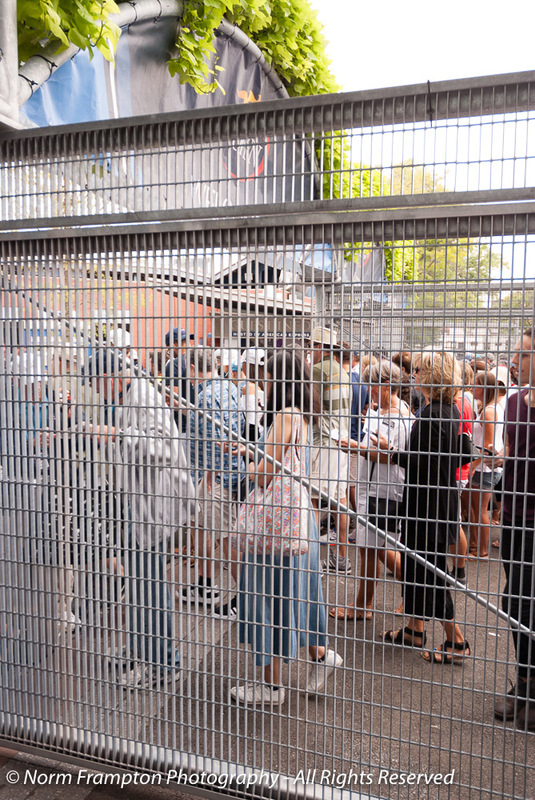 With over 2 dozen courts and all of the worlds top players in attendance, once you make your way inside the complex you are in tennis heaven. 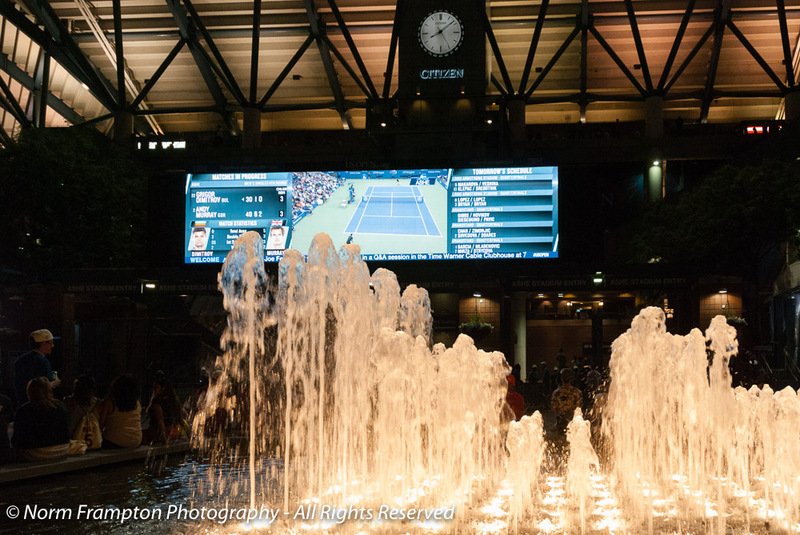 With the prestige of a Grand Slam event, the total prize money well in excess of $50 million USD, not to mention the location, the atmosphere is electric. The doors to Armstrong Stadium, the second largest of the three main stadiums, are found right below the giant manually-operated scoreboard. Did Federer win his match? Battery running low and need to charge your phone or tablet? No problem. Just plug your device in at this free charging station. Close and lock the door and come back between sets. Of course we true fanatics stay until after sundown to admire the entrance to the main stadium from beyond the illuminated fountains below the giant screen. 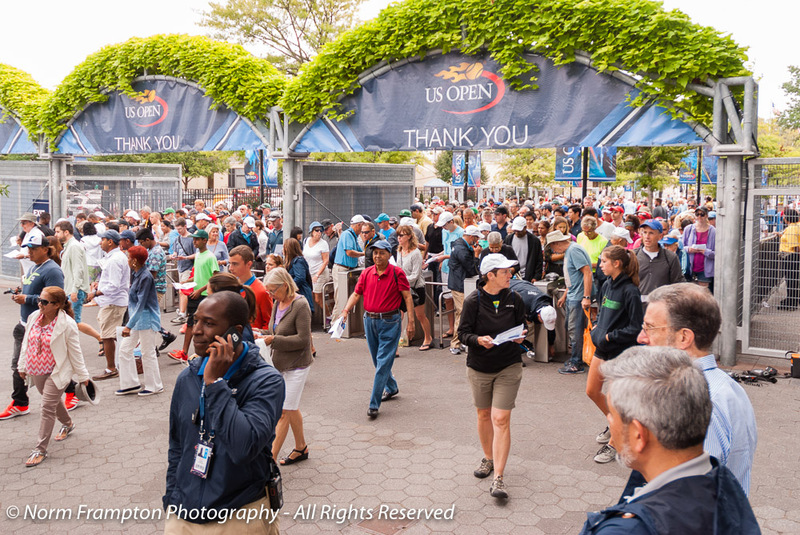 Gallery | This entry was posted in Photography, Thursday Doors and tagged Flushing Meadows, National Tennis Center, New York City, Tennis, Thursday Doors, U.S. Open Tennis, USA. Bookmark the permalink. I love the photo of the train yard! cool pictures. I do watch tennis sometimes. Not a real fan though. Tennis is one of the very few sports I like to watch! But to go by train to go to a game would be new for me:) You have great archives, Norm! Love the picture of the train maintenance yard. I love all the perspectives you’ve shown in the photos. The train shots make me want to get out and try to capture some of my own. 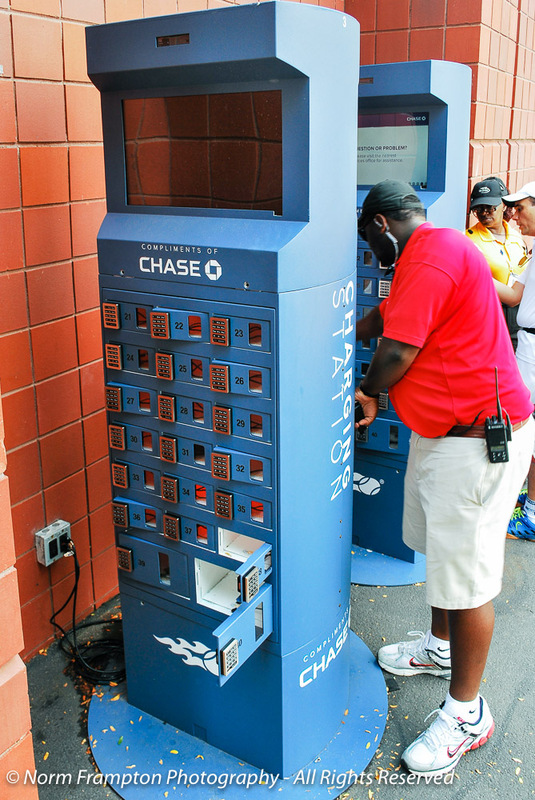 That’s very genius on their part with the charging stations. I’ve not seen anything like it. Great post Norm! Thank Amy. I was pleasantly surprised by the charging station myself. It’s a very real need in our electronic device driven world. Norm – the doors on the charging station are fun – and many – but that photo also time stamps what is trendy and in- smart phones. 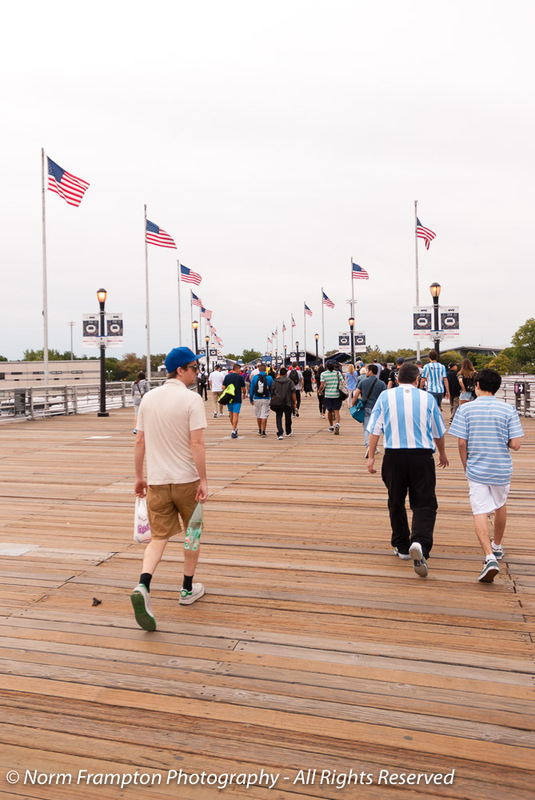 the 5 minute boardwalk walk…the flags – the angle – the spacing of the people – heck – even the feet of the three front folks seem to have synchronicity with their heels up. First, how lucky to score tickets to this event! I’ve heard how difficult it is to obtain them. Second, I’ve never seen such a charging station like the one you’ve shared here. I don’t know how secure I’d feel leaving my phone but if I needed the juice, I’d probably use this! It must cost…how much, if you remember? Great post Norm. Merry Christmas season to you. 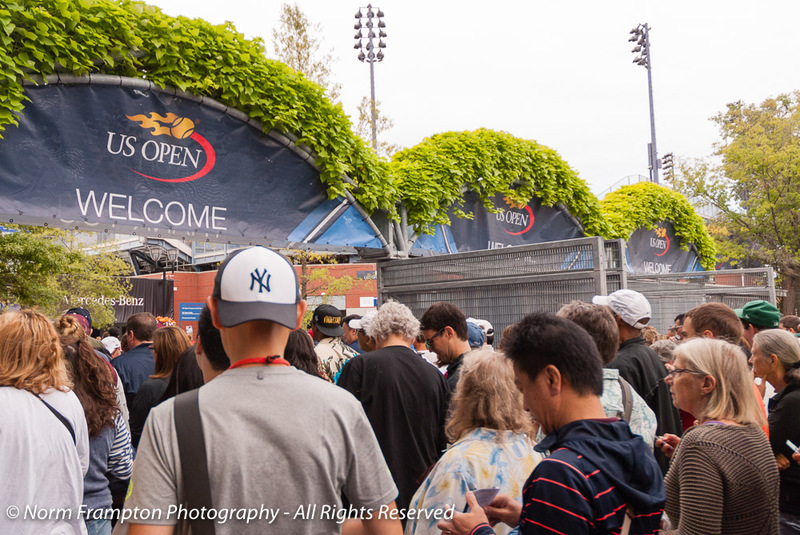 Compared to the other grand slam events tickets for the U.S. Open are actually not that difficult to get. GOOD tickets however…well that’s a different story. Wow! Dan is sure going to love those train shots. I’ve never seen a phone charging station before, I’m pretty sure we don’t have anything like that here in Ireland, but I must keep my eye out for them – they’re sure to arrive at some point in the future. Thanks Jean. I was specifically thinking of Dan when I took that shot. Thank you Tara. If you’re even a bit of a tennis fan this is one of those must-see events that you can actually get tickets for. I love all the doors on the trains in maintenance yard. Cool photo. As for tennis… well, I’m glad that someone enjoys watching it. However, your photos of this venue make it look like a wonderful place to visit. I was in Flushing when the Beetles performed at Shea Stadium. I could hear the screams from our apartment on Maple Avenue off Main Street. I love the shot of the trains all lined up. That’s a great photo! 🙂 Nice dooring, Norm! Great photos, Norm and great doors. Of course I love the trains. Actually, I have a similar picture hanging on a tall wall in our family room. 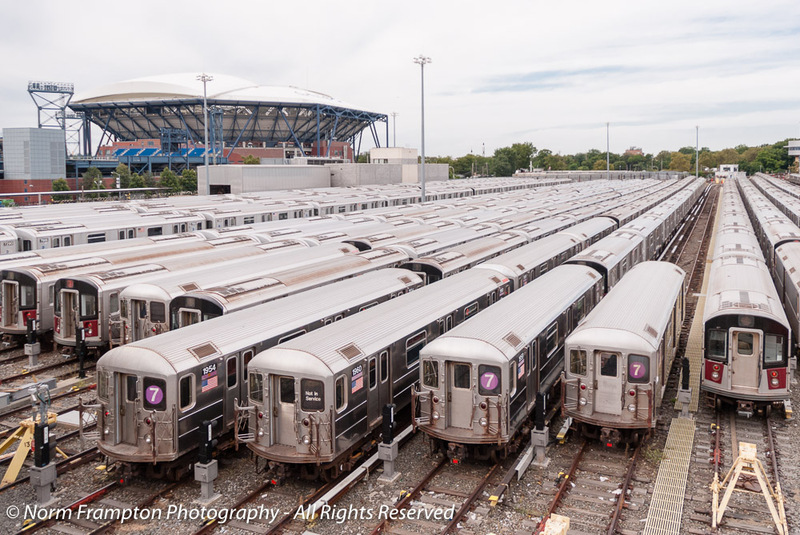 It’s a rail yard on the west side of Manhattan, taken from the High Line – but that look of all those trains is amazing. I think my favorite is the charging station doors. What a great idea! I’m not much of a tennis fan, but I can relate to going early, staying late and taking in as much as the venue has to offer. If I ever win tickets to a Grand Slam event, consider them yours. Thanks Dan. I’ve been saving that train yard pic in the archives with you in mind for a while now. I appreciate that Norm. When you see those yards, knowing that there are several, it gives you an idea of just how big that system is. The free recharging stations win my “favorite of the day” award. What a great thing for them to have! Retractable roofs are definitely doors, and I love those recharging stations! I’ve never seen anything like it, but what a great idea! You did a great job of capturing the ambiance, but I could feel my breath tighten at the picture of the early crowds. Yikes. Thanks Joanne. If you have reserved seats you can avoid the crush of humanity and just come a little later. I was actually surprised that everyone was pretty calm and there were no mad dashes to get to the best available seats. The subway makes it really easy to get there.